UNDP and UNEP are pleased to announce the launch of the post-2015 global consultation on environmental sustainability. This is one of a series of national and global (thematic) consultations convened by the United Nations Development Group to help shape the post-2015 development agenda. put global development on a more environmentally sustainable path that can lead us to the world we want. In developing the post-2015 development agenda the world now has the opportunity to turn these innovative ideas into solutions that can shape the future. In this first phase of the global consultation on environmental sustainability – now until January – we invite you to propose topics and questions that you think should be among the priorities for further exploration. You can do this by responding to the call for discussion notes and sharing your experiences and thinking on the online platform.Early in 2013 the consultation will bring together leading thinkers in a meeting to review the submissions from the first phase of the consultation. Some of those who submit Discussion Notes may be invited to participate in this meeting. This meeting aims to select from and refine the identified topics for a more focused in-depth online discussion in a second phase of the consultation during February and March. A summary report will be an input to the High Level Panel of Eminent Persons on the Post-2015 Development Agenda (HLP), as well as to the inter-governmental debate on the post-2015 development agenda starting with the 2013 UN General Assembly.All are welcome to join this consultation. Help us spread the word to civil society, academia, private sector, governments, the UN system, and beyond. Now is the time to get involved to help shape the global development agenda.Click here to join www.worldwewant2015.org/sustainability.In addition to this thematic consultation on environmental sustainability there are other opportunities to engage in Post-2015 consultations through global, thematic and national processes. Please visitwww.worldwewant2015.org for more information. 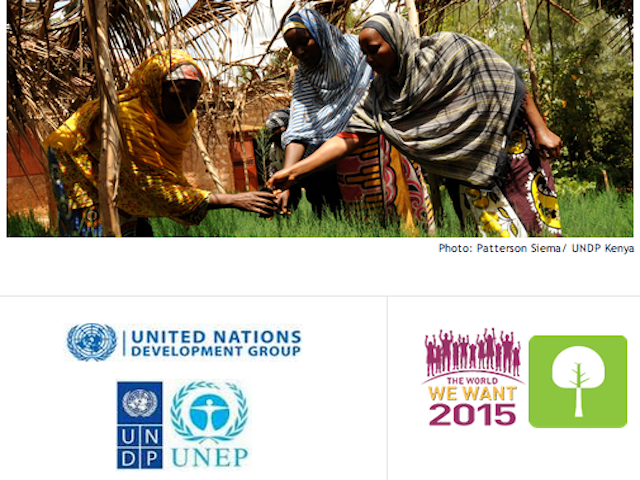 The online moderated discussion on governance and accountability in the post-2015 development framework is now open. The e-discussion will run in two phases over the course of four weeks (19 November 2012 to 14 December 2012) and will ultimately feed into the final multi-stakeholder governance consultation, slated to take place in Johannesburg, South Africa at the end of February 2013. Phase I (19 November – 2 December) will reflect on the lessons that have emerged about the role of governance in the achievement and sustainability of the Millennium Development Goals and other international development goals. The overall guiding question of this phase of the e-Discussion is:What should be the governance building blocks for a post-2015 agenda? Dimensions of governance: How can multiple dimensions of governance be included in a global development framework? Why is governance relevant for the achievement and sustainability of development priorities? Feasibility of goals: Is it desirable or feasible to propose governance goals and targets in specific areas? What are alternative approaches? Some areas of examination could include civic participation, capacities of public institutions, global governance, and global partnerships and policy coherence at all levels. What is the role of information and communication technologies (ICTs) in governance? We would be grateful to receive your written contributions in the forums below.